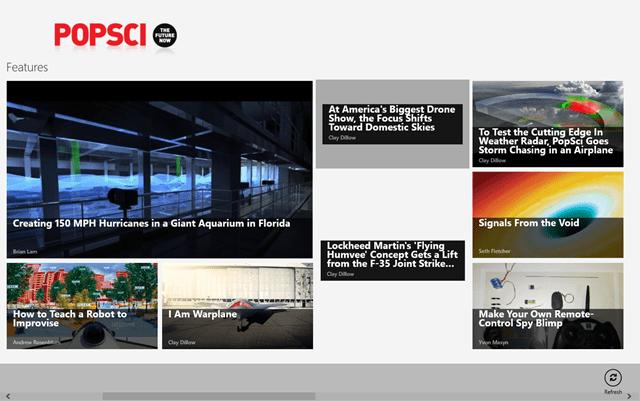 POPSCI is a Windows 8 Science App which let you know about the greatest revolutions taking place in the world of science. 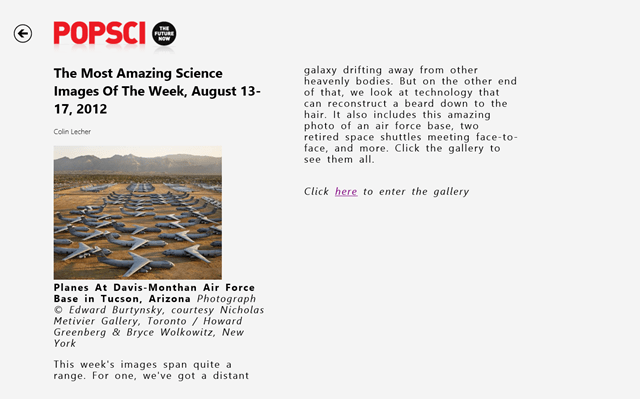 It’s the Popular Science App for Windows 8 where you can read latest science stories. How many things do you actually know about science and the latest technologies and discoveries going on in this world? Do you really have the time for that? Just leer around and watch the world moving towards modernization in the field of science and technology. In such a fast-moving world, you have to move with the relative velocity as the new technologies are taking you with them. But, who has time to wait and look at it. This is where POPSCI comes into existence. This Windows 8 science app is a leading source of science and various technologies news. Its kind of the best place to browse through latest inventions and technologies, especially for the students who are the payload of this modern society. So, you can look at this Windows 8 app here, pretty good. Well, you can read the latest news related to science and technologies by simply clicking on the news post over here. And drain all the knowledge you can get from here into your brain. Its a great science app for Windows 8, designed for the student community who want to keep them updated with the latest technologies. You can read articles and can also read about the detailed research by clicking on the related keywords. And, it will redirect to the related news with the help of your default browser. You can also purchase the weekly magazine by simply clicking on the Online Tab. 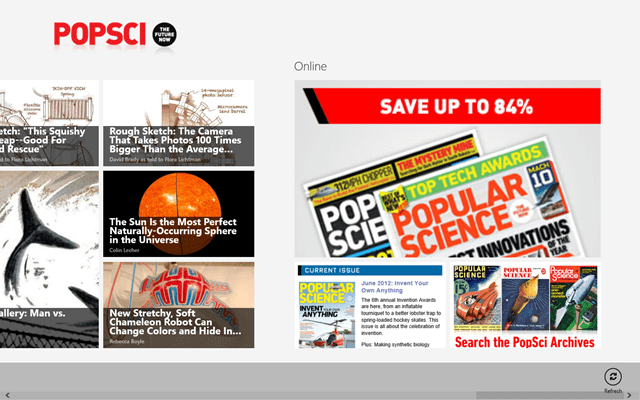 Subscribe the latest magazines and tabloids from popularscience by clicking on the tab. So, what are you waiting for? Just download this Windows 8 science app available under ‘News & Weather’ category of Windows 8. Keep yourself updated.